Federal Cuts To Health Insurance Navigators Draw Complaints : Shots - Health News The federal government has sharply cut funding to groups that help people enroll in health plans. But the groups say federal officials don't understand how much help and follow-up some people need. 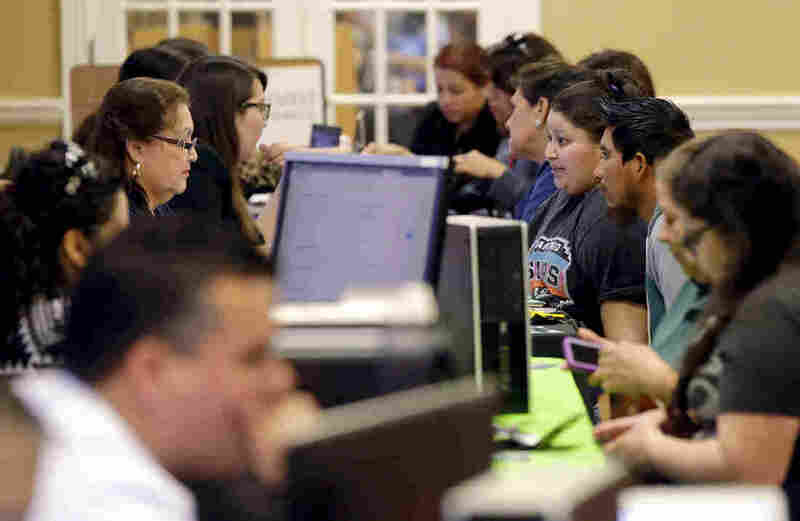 Affordable Care Act navigators helped guide those looking for insurance during an enrollment event at San Antonio's Southwest General Hospital last year. Beyond helping with initial enrollment, navigators often follow up with help later, as an applicant's income or job status changes. The Trump administration says many of the organizations that help people enroll in health plans on the federal insurance marketplaces don't provide enough bang for the buck, sometimes costing thousands of dollars to sign up each customer. So it is cutting their funding, some by as much as 90 percent, the government told the groups last week. But the navigators, as they're called, say the government doesn't understand the time involved in the effort or the complexity of the enrollment challenge. Nor do federal officials appreciate the variety of tasks that navigators are asked to handle, they say. Some customers don't know how to use a computer. Many don't understand insurance lingo — what's a deductible, anyway? — and don't know how to pick the best plan for their needs. Consumers get confused about how to estimate income and determine household size to qualify for premium tax credits that are available for people with incomes up to 400 percent of the poverty level (about $98,000 for a family of four). What if you're self-employed and have no idea how many hours of work you'll get next year? If Grandma is a dependent, does she count as part of the household? What about mixed immigrant families, in which one member is undocumented and ineligible for health insurance? These are the types of vexing questions navigators say they routinely field. In addition to helping people sign up, navigators often assist them throughout the year as their income or job status changes; navigators offer community outreach and education services. Marketplace coverage is complicated and so are people's lives, so finding the right plan, insurance navigators say, can be tough. "You can decide on the best policy, but people come from so many different backgrounds and experiences that it's impossible to have a policy that can be applied uniformly," says Sabrina Corlette, a research professor at Georgetown University's Center on Health Insurance Reforms. The center has run a technical assistance project for navigators in recent years and produced an online guide that addresses frequently asked questions. 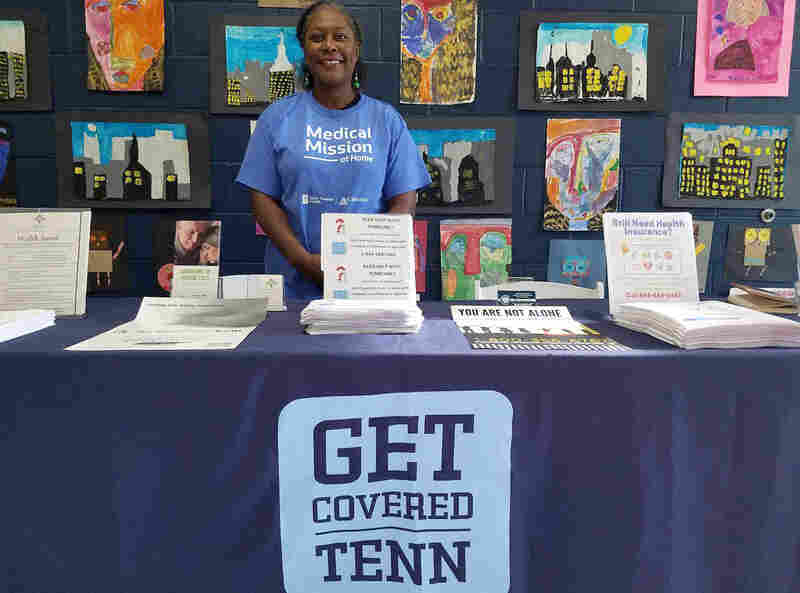 Sandy Dimick is program director for Get Covered Tennessee, part of Family and Children's Service, the state's primary navigator grant recipient. She says one of the common issues that navigators there deal with is helping self-employed people estimate their income for the coming year to know whether they can qualify for federal subsidies to help pay for their insurance premiums. "We're in Nashville — Music City — and lots of musicians are contract workers," she says. "They think they qualify for subsidized coverage, but by the time they deduct their expenses they may be in the Medicaid gap because we didn't expand Medicaid here." She was referring to people whose incomes are below 100 percent of the poverty level, the minimum amount to qualify for marketplace premium tax credits, but who earn too much to qualify for Medicaid. Navigators can also be instrumental in helping clients save money on out-of-pocket costs, she says, because the federal health law offers cost-sharing reduction subsidies for people earning up to 250 percent of the federal poverty level (about $30,000 for an individual in 2018). The subsidies may bring their deductibles down to zero — potentially saving them thousands of dollars in out-of-pocket costs, Dimick says. But many marketplace customers don't know about the subsidy and don't realize it's available only if they buy a silver plan on the marketplace. Unless these people work with a navigator, they may miss out, because those who are financially strapped lean toward purchasing the slightly cheaper bronze plan that doesn't qualify for cost-sharing reductions. Dimick says her group will lose 15 percent in federal funding from its $1.6 million grant — about the amount it had anticipated. Helping people understand how the marketplace coverage works is an ongoing challenge, says Elisabeth Benjamin, vice president of health initiatives at the Community Service Society, New York's largest navigator program. New York state runs its own ACA marketplace, and Benjamin says she doesn't expect a funding cut. "People are still struggling with the metal levels," Benjamin says, referring to the bronze, silver, gold and platinum plan types offered on the marketplaces that pay from 60 to 90 percent of covered medical expenses. "They don't understand that if they have premium tax credits and cost-sharing reductions they shouldn't just lurch to the lowest-cost bronze plan." "A lot of the people I work with have limited technological capability," says Garrison, the health initiatives manager at the Ohio Association of Foodbanks in Columbus, which leads a statewide consortium of navigators. "They can't work on a computer." The federal Department of Health and Human Services has cut her group's navigator funding by 71 percent for the coming year, to $485,967. The Trump administration says it is taking a hard line because the navigator groups have not shown that they are providing good value. Last year, the groups received $62.5 million and enrolled 81,426 individuals. The administration says the new funding formula is based on how well each group did toward meeting its 2017 enrollment goal, but many navigator groups say there doesn't appear to be a correlation. The federal Centers for Medicare & Medicaid Services, which oversees the federal marketplaces, has a toll-free call center. When asked if it plans to increase staffing or undertake other enrollment activities this year, officials said that "CMS will continue to operate our year-round exchange call center to assist consumers with enrollment and, as in past years, we will ramp up staffing to support the higher call volume anticipated during open enrollment." If navigator teams are thin on the ground this fall, people can opt to sign up directly with insurers or brokers. The federal government plans to launch a "help on demand" tool on HealthCare.gov that will connect consumers directly with agents and brokers, according to a blog post on the Health Affairs website by Timothy Jost, a professor emeritus at Washington and Lee University in Virginia and specialist in health law. But advocates have expressed concern that consumers may not get impartial advice from vendors who receive sales commissions for specific insurance products. In addition to HealthCare.gov, some other groups have published detailed information aimed at navigators that may help intrepid consumers get answers to enrollment questions. The Georgetown navigator guide is available online, as is information from the Center on Budget and Policy Priorities. The published CBPP information may be helpful to some individuals, but it is not a substitute for navigators who help people one on one, says Judith Solomon, the center's vice president for health policy. "It's not boots on the ground," she says.